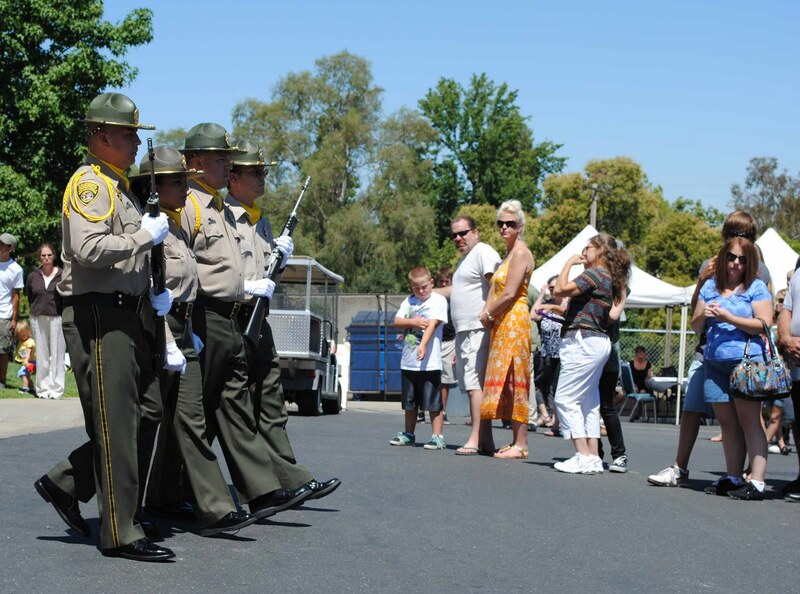 California State Prison, Sacramento and Folsom State Prison celebrated their first annual Family Day recently. Family Day brings together family members and friends to come and enjoy a day at the prison. Tours were given so families can understand the staff’s work environment. Visitors also were allowed to see inside the secure perimeter and to enter an actual cell at the institution. The day began with the CSP, Sacramento Honor Guard presentation of the colors and then the national anthem was played at which time Warden Tim V. Virga honored the names of fallen correctional staff and joined Warden Rick Hill in welcoming families from both prisons. “It was such a pleasure to be a part of the celebrated Family Day at our Institution,” said Warden Virga. “To witness the friends and family members participating in the activities and through the tours, they were able to become aware of the work environment that the staff place themselves in each day. The ability to allow friends and family to experience this event was very rewarding”. Many different departments volunteered to sponsor interactive booths where children of visitors enjoyed themselves. The Folsom State Prison Fire Department allowed the kids to activate the sirens and experience the powerful water hoses. Both the Crisis Response Team and In Service Training booths demonstrated to the public different emergency response techniques such as using the expandable batons on target dummies and dispersing water filled OC canisters. The young adults enjoyed all the activities. The Sacramento Fallen Officer Resource Fund raised money for their cause by selling BBQ meals and offering commemorative t-shirts for purchase. Approximately 600 family members attended the event with more than 300 meals served. More than 350 family and friends toured our prison. Warden Virga initiated this program based on his past experience of Family Days in the early 1980’s and the success they had then. This event allows families to get acquainted with other correctional families and provides the opportunity to see and experience the environment correctional staff place themselves in every day. The day was topped off by a large car and motorcycle show with entertainment provided by a Johnny Cash tribute band called the Cash Prophets. The success of this program was attributed to Warden Virga initiating the program and to all of the volunteers and off duty correctional staff that donated numerous hours of their own time to make the day a complete success. CSP, Sacramento and Folsom State Prison are proud of the success of this event and are looking forward to more events in the future.